When it comes to landscaping materials, it’s hard to have too much of a good thing. Whether you’re a contractor stockpiling supplies for multiple projects and storing it at a worksite until it’s needed, or a homeowner who ended up having significantly more than you bargained for: properly storing mulch, topsoil, and compost will allow you to reuse the material at a later time. This is important because leaving these material exposed to the elements can lead to damage or decay of the material, costing you money and requiring disposal of the useless supplies. When it comes to storing organic materials like mulch, topsoil, and compost, you want to slow down the growth of fungus, decay and rot, and the leeching of nutrients. These materials need two things to avoid this: avoiding excess moisture and keeping the air flowing. This will help keep these landscaping supplies in good condition until they are needed. The length of time for storing these materials will affect what measures and storage methods you can and should employ. For short periods of time most of these materials will be fine. But, if you’re planning storage for longer, such as over the winter or for the final step in a multiple-month project, you’ll need to take more steps. Permanent or near-permanent storage of these will require more planning. Short Term Storage (1 – 3 Weeks): With the exception of major weather conditions (heavy rains, very-high humidity), no significant issues should come from leaving these materials exposed. Examples: storage for immediate project or use in another upcoming project. Medium Term Storage (1 – 2 Months): If you’re in an area expected to get rain within this time, use a tarp and stakes to cover the pile. Stakes should keep the edges of the tarp off the pile and ground and allow air flow. Examples: Long site storage or short-term stockpiling. Mulch, especially those that contain wood chips, can sour during storage. Never store them in low or no air areas: as the oxygen in the pile starts to be reduced, organic carbohydrates in the mulch start to break down and ferment. The result is high-pH acids that are toxic to plants. Rain will both erode the topsoil and leech away nutrients. For long term storage, compacting the top layer of the pile will help against erosion, though the use of a tarp is still recommended. Of course, the best option is to avoid the need for storage in the first place. If you’re in the New England area, Greener Horizon can help. 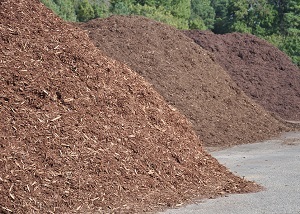 We offer a variety of mulch, topsoil, and compost in bulk. We can come to your site and help on a consultation for the materials you need, and can even help with installation. See our Landscape Supply page, and contact us to learn about our contractor discount.